I’m still flat on my back letting my poor disk heal but I can’t say it’s been peaceful. The weather has been abominable lately. The wind turned south and is gusting well into the 20s. The south wind means a long fetch up the lagoon and the boats here on moorings at the Mai Kai Yacht Club and nearby at anchor are bouncing and slamming in the chop as much as we would be at sea. The constant motion makes it hard for me to find a comfortable position, and we both had very little sleep last night, me because of physical discomfort and Jack because he was up every hour or so to make sure the mooring lines were good and that the dinghy was safe. We always raise the dinghy out of the water at night but since my back problem I can’t help him do it and it’s a two person job. So the dinghy bounces and slams just like the big boat and we just hope it doesn’t get swamped or otherwise compromised riding out there in nasty conditions. Luckily these moorings are inspected and safe so except for checking for chafe on the lines we feel it’s the best option for us. And you can’t beat the pretty good wifi. The Internet access has been my saving grace while I recuperate. I’m caught up with friends and family, I can participate in social media for a while, tap into the pop culture phenomena that I’ve missed over the last eight months of marginal access, and read back stories on news events that I’ve barely had headlines on for most of this year. Most of all I can dig around for more lost ancestors while I take advantage of newly digitized and available public records. Except for that whole back pain thing, I’m in cyber heaven. Still, I’d rather be Out There. 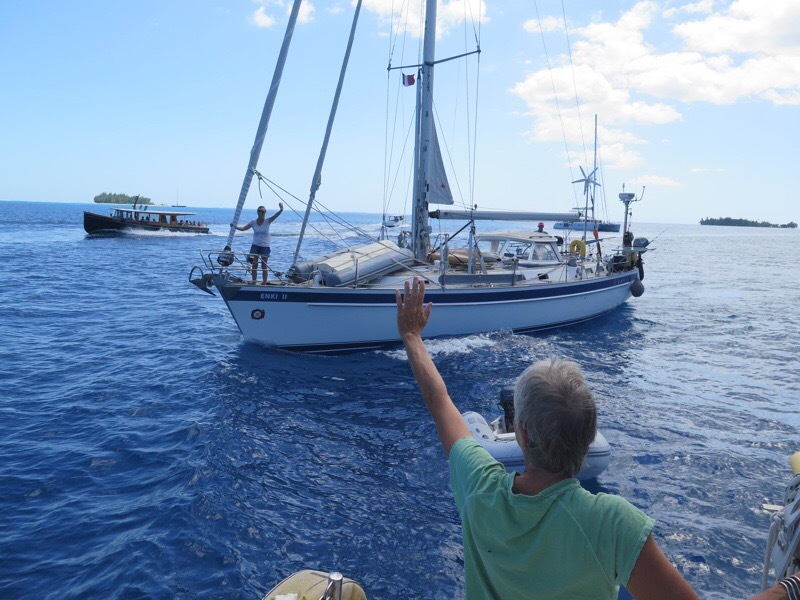 We’re following the progress of our good friends on Enki II and Liberty Call, both en route to Tonga, and they’re not having a fun time of it either. Too little wind, too much wind, the usual stuff. I try not to feel left behind, but when our dear friends on Macushla leave probably next week we will really be in the company of new friends rather than old friends. That’s not a problem in itself, but it’s hard enough in this weird cruising life to say hello and goodbye almost in the same sentence so that when you’ve spent significant time in company with special people your bond deepens quickly and the goodbyes are so much more wrenching. For me particularly having close women friends feeds my soul and I will miss Diana and Sue more than I can express. We three are so much alike and needed no adjustment time at all to fall into a friendship that feels like it’s alway been there. I don’t like that I’m whining. I am improving, just very slowly. This is a life lesson in patience, a trait that no one would list under the heading Marce’s Best Qualities, so I will take it as such. In a couple of weeks we’ll have to make the Go/No Go decision, but in the meantime I’m tuning up my snark on Facebook. Best to not no whats going on in this wacky Country at the moment. Enjoy your peace. Actually it makes me feel better to know I’m not there under the daily barrage of insults to our intelligence. I can look out the window and know that I won’t see Trump’s face anywhere at all. My sympathies to you all. Although I know you’d much rather be writing about not having a good passage to Tonga, but once again, you’ve written a wonderful, thoughtful post. I just wish I could wave my magic wand and make you better. Have you tried boric acid ointment?